No matter if you prefer to get around on foot, by bicycle or behind the wheel of a motor vehicle, we all need attractive, convenient and safe facilities. Wisconsin now has a Complete Streets law, so as our roads are reconstructed they are being engineered to accommodate people on foot and on bike, but even after every street is a complete street, people will still need to follow the rules of the road and be aware of others. Even the most complete street will not be safe if motorists speed, pedestrians dash into the road from between parked cars and bicyclists run red lights. To address those safety issues we need good education programs so everyone knows their rights and responsibilities, enforcement for those who break the law and efforts to encourage people to be considerate of other road users. To address those other important “Es,” in this spring the Bicycle Federation of Wisconsin has teamed with the Wisconsin Dept. 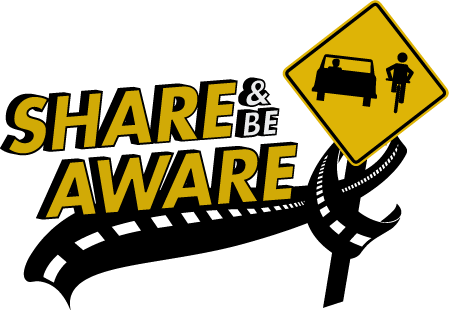 of Transportation Bureau of Transportation Safety to launch a “Share and Be Aware” program. Using a combination of traditional marketing techniques like billboards and public service announcements, as well as in-person appearances by Share and Be Aware Ambassadors, the program is attempting to reach all road users with positive safety messages that emphasize rights as well as responsibilities. After only a few short months, we have already made quite an impression. Our billboards and radio PSAs have been seen or heard by more than 600,000 people in cities across the state. LaCrosse and Eau Claire have been very actively promoting the Share and Be Aware messages. Let us know via the comments below if you have seen one of the signs or heard a PSA. The new billboard below, sponsored by Wheel and Sprocket, will be going up in the Milwaukee area soon. You can view videos of the public service announcements on the Bike Fed YouTube Channel by clicking here. The radio spots are basically just the sound from the videos. Below is a sample. Watch the video and then play it again with your eyes closed to imagine it as a radio PSA. To request that a Share and Be Aware Ambassador come to your workplace, school, church or event, fill out this form or email matt.gissbl (at) bfw.org. I’m not against education, but it seems more like a desperate act to cover up the deficiencies in bike infrastructure then anything that would make life better for bike users in any appreciable way. It will do little to nothing to actually increase bike use. Infrastructure is the key to both bike safety and increasing bike use. The complete streets document you linked to is flat out against protected cycle tracks. It makes the mistake of thinking you can place a bike lane on a high volume arterial street and expect folks to use it to any great degree. The document is deeply flawed. That is much more the heart of the problem rather then education. While I always say “Engineering first,” I have to disagree about the importance of the other Es. I am a HUGE believer in the power of protected bikeways to attract more riders and correspondingly decrease crash rates. I am also a realist and understand that we can’t build separated facilities everywhere, and we shouldn’t have to. We shouldn’t need a pedestrian bridge over every road to get motorists to yield to people in a crosswalk for instance. In the six years that I was the Bicycle and Pedestrian Coordinator for the City of Milwaukee, we added many curb extensions, painted crosswalks, median refuge islands, speed humps, in street yield to peds signs, and on and on. Despite all that engineering, we still have pitiful motorist yield compliance rates for pedestrians at crosswalks. If infrastructure is all we need, why does the pedestrian in Milwaukee stand on the curb extension, in front of a painted crosswalk, with a sign on the centerline that says “State Law Yield to Pedestrians in a Crosswalk” and wait until the street is completely clear of cars before attempting to cross the street when the pedestrian in Portland puts one foot off the normal curb, in an unmarked crosswalk and starts moving across the street? Milwaukee arguably has the safer infrastructure in this scenario, but the pedestrian in Portland gets across the street first. The reasons have to do with the other Es. First, because both the pedestrian and the motorists in Milwaukee are poorly educated about their rights and responsibilities, second because the pedestrian has little faith that his right to cross the street are being enforced, and third, because we culturally do not chastise our fellow citizens when they fail to comply with the law. I remember the first time I visited a friend from Milwaukee who had moved to Seattle about 20 years ago. I was driving a rental car with him in the passenger seat as we went past Green Lake, when he screamed “WHAT ARE YOU DOING?” Shaken, I looked around and said “what?” He responded “That guy back there was waiting to cross the street. YOU’RE SUPPOSED TO STOP!” While I had been driving for about 15 years at the time, this was the first time anyone had ever hollered at me for not yielding to a pedestrian. Lack of education, enforcement and encouragement are the reason pedestrians have a hard time crossing the street and die at a higher rate than other road users. We have WAY better pedestrian networks in Milwaukee than they do in Seattle. Heck, half the streets in Seattle don’t even have sidewalks, let alone ADA compliant curb ramps. 98% of the streets in Milwaukee have 5 ft wide or wider sidewalks and we have updated ramps at every corner. So while we agree, infrastructure first and foremost, I have to respectfully disagree with you about the importance of the other Es. Tri Faster (Lauren and Todd Jensen) is also helping to raise funds for more billboards in addition to the support provided by Wheel & Sprocket. We are matching the first $1000 in individual donations targeted for the billboards. Anyone is welcome to donate directly to the Bike Fed of WI for this via their webpage at http://www.bfw.org/donate. AWESOME!! Sorry I did not mention that. I’m still new at the Bike Fed and don’t quite know about all the irons in all the fires. Please keep me informed of the work you are doing. I will eventually have my fingers on all the pulses, but until then I can use any help I can get. I’d love to see a Share and Be Aware Ambassador at an event way up here in Marinette. Haven’t yet, but Marinette has so few big events…. BTW, I believe education is key, but only goes so far. Police MUST enforce the laws on the books. And I know budgets are stretched thin and local law enforcement cannot sit on every corner, but when an officer sees a car zip through an intersection with people in both crosswalks, should they not pull the driver over? I’d bet if local law agencies set aside one day a month and had a car randomly sitting at intersections, they’d write enough tickets to more than pay for the officers time sitting there. I defy anyone who reads this to sit at an intersection, any intersection, for an hour and tell me they saw no one roll through, or clip the corner with folks in the crosswalk… conversely, I’d bet you’d see a few bike riders being hair-brained too. No amount of awareness will solve the issue unless the law slaps enough people on the wrist, hard! Thanks Ralph, if you could pick an event (cycling or otherwise) in Marinette for an appearance by an ambassador, what would it be and when is it? There is also a large 4th of July Celebration and the National Night Out, both of which are centered on Stephenson Island right on the Menominee River. I think the National Night Out would hit a wider cross section of the public, especially kids and occasional riders….. Thanks dude. This post was super helpful. The ONLY info I could find about bike racks @ the aroprit & then you even went the extra mile (pun intended) by providing route tips and a well annotated google map! What’s the emoticon for clapping hands? because that’s what I’d type in here ____ .Biked up Oklahoma to Howell to catch your route and a 6am flight. A little bit of a struggle that early in the morning up the invisible but totally-noticeable-with-stuffed-backpack-and-computer-bag gradual incline of Howell. However, the bonus was that, after my overnight flight back into MKE, the cruise home was that much no-peddle. Infrastructure is important and so are messaging campaigns; I like to see both continue to grow. However, people follow incentives, both positive and negative. When it comes to making roadways safter the only path to a big positive impact on the general public is to make it be known you will be penalized if you endanger cyclists and pedestrians. I’ve never seen a police officer pull a car over for passing a biker too close; I have seen police cars blow right past me as I waited at a crossing. When people are ticketed for causing an accident with a pedestrian their is rarely any real consequence. Most amazing of all if you kill a cyclist due to questionable driving the legal consequences are often trivial. You could be in deeper trouble rear ending someone’s luxury car than hitting a cyclist. Nothing will change until culturally we move to a time where people may perhaps regain more respect for each other and our communities; don’t hold your breath on that one just yet. More importantly in the short term we need it understood through actions that law enforcement values the lives of pedestrians and cyclists and WILL consistently write tickets for $$ and points against drivers who threaten them. Thanks for the comments John. That is exactly what our proposed vulnerable user legislation is about. I’m not sure if we can get it passed this session, but we will certainly keep trying. I think about it in terms of when we drive cars down neighborhood streets with children playing, we must take extra caution because a child may run out into the road. As drivers, we are responsible for the safety of those around us when we are piloting a dangerous vehicle. The same holds true when driving past people on bicycles or in areas where it is likely that people may be bicycling. Wow I love these conversations. Some things I would like to add are that the PDF provided for users to access is outdated in its appearance, way too complicated for an average visitor in its length. I would argue to those who think it’s highly flawed. It’s flawed in the sense that its coming from a one dimensional perspective on prosperous urbanization, not necessarily on the facts it provides. There has to be a serious marriage between public safety, Infrastructure, and education. All falling under the umbrella of another marriage which is the people and government. We have to continue to ask for these things but we don’t often ask because there is no stress to the importance of the incentives-to voicing, which is an overarching better quality of living, place making, places where people REALLY want to be. I am excited to be apart of the Wisconsin Bike Fed. this season. I look forward to providing at least one element, that is education to citizens of their rights in schools, and in Wisconsin at large. bike sc’s as belowe are my favorite infrastructure option. at least the numerous existing one can be mapped. one way to do this is have this site put up a map of each municipality (fox point, bayside etc) and let the residents or anyone else mark their sc’s by computer. one could also map potentiall best plarces to put sc’s. To integrate bikes into the transportation system map, mark. and make interconnections preferably between secondary roads as bike shortcuts. These places can be defined as places bikes can go and cars can’t. Taken as a whole this will form a freeway system for bikes. These interconnections can be of the following types: 0) ones that now exist but are unmapped, 1) along property lines and fields, 2) special RR crossings between existing crossings, 3) pedestrian bridges, 4) roads where cars should be banned such as those in parks. Thousands of such places exist. To implement I wuld determine those roads best for bikes and find their interconnections first. Additionally secure locking facilities should be provided as well as the right to piggyback on buses. Piggybacking provides access from home to mass transit to destination and visa-versa. The advantages of these shortcuts + secondaries compared to dedicated bike lanes is: a) they are cheaper to build since they interconnect existing roads, b) as they are shortcuts they make bikes faster then cars, c) they draw bikes off arterials increasing safety. Cars should be highly taxed, their size limited, and their road and parking structure allowed to deteriorate. Specifically, when a road is due for repair fix only half its lanes and make it one way. The synergy is as cars become more impractical people will look to alternatives. As bikes are much faster do to the shortcuts they will be the main one. More bike usage increases the demand to piggyback on buses causing more buses to be put online yielding lower fares in turn leading to more bus use. Piggybacking itself means stops can be fewer making the bus faster/cheaper yielding more bus use ad infinitum. Thanks for your thoughts Jennifer. I will mention the idea of the awareness shirts. There are some companies who already make 3 ft shirts and jerseys, but perhaps one that looks like our billboards would we worth printing. I will also mention the idea of posters. You can buy the 3ft yard signs, which are a landscape format, but about poster size. I can also make that PDF available in a hi-res format so people can print their own. Great ideas, keep watching our blog for updates. To your other point, you are absolutely correct. We walk a fine line between bike safety awareness programs and scaring people into thinking riding a bike is dangerous. Almost every statistic shows that riding bikes is very safe compared to other activities (even compared to driving a car). The way we spread the awareness message is very important. Enforcement and education are also key and we are working on those fronts just as hard. If you read my recent blog post, you know my 16-year-old daughter is taking drivers ed and she got zero information on bike laws or even pedestrian laws in the class. Furthermore, there were no questions on her written test about bikes or pedestrians besides the mandatory one about white canes. We are working at the state conference of driving instructors to change the education and are discussing legislation to have mandatory questions on the drivers test. Our Vulnerable Users legislation is designed to make it easier for district attorneys to charge people how hit someone walking or biking. We also do law enforcement training classes. It is no easy task make these changes, and we are a small organization in a big state, but we are doing all we can. We really do rely on our members to help, such as the recent Hostel Shoppe billboard. But it gets right down to the individuals. Watch our blog for a post about how we are working to help a 16-year-old girl in Sheboygan do bike safety program for teens in drivers ed. With the great support from our state Wisconsin DOT, our great bike industry and the 600,000 enthusiasts in Wisconsin who ride bikes as often as they can, I am hopeful that we can make a difference. This is just so exciting! I am hoping to start spreading the word to other people on campus who bike, but I cannot say that it will have a great effect. One must be the change they wish to see too. I completely agree about being the change you want to see in others. If you read some of my other blog posts about the tragic crashes this year or about our proposed vulnerable user law, you will see I have the same opinion. I obey the traffic laws on my bike and in my car and I let my friends and family know that I do when they are with me or I am a passenger with them I don’t get a lot of offers from other people to drive me places because I often comment if they are speeding or fail to yield to pedestrians. If you want any yard signs or the pdf file of that image, let me know. Thanks again for making a positive impact through your own actions. How do I get a yard sign? Dennis, you can get yard signs though our online store here: http://bfw.org/join_us_today/merchandise/. You can also get them at our offices in Milwaukee and Madison, at Wheel and Sprocket stores and some other local bike shops. If you have other questions about the signs, contact Matt Gissibl in our Milwaukee office 414-431-1798. Whoopee – I have seen the “Share and Beware” signs – but in the windows of Wheel and Sprocket. Really? What impact will this have? If you are going into one of these stores you already know to give 3 feet. These signs need to be posted in front of the idiot drivers on the road. Good placements would be atop of gas pumps throughout MKE so that when one is filling up with gas they might read the signs and THINK what these signs mean. If you are looking for specific routes, I would highly recommend placing these signs all alone Hwy 100 at least from Janesville Rd up to Capital Rd and in the median, maybe one every 1/4 mile! This should be doable since this campaign is in partnership with WIS-DOT. I think other bike riders should have a say on where these signs go. They know the areas of town that need them. No reason to have them posted in bike shops or in front of ones house! I have ridden bikes in Chicago, NYC and in Florence Italy – all cities with supposedly crazy traffic. Sad to say, MKE has some of the rudest and most hostile car drivers out there. I never got honked at in those other cities – even riding in the road and not on a designated bike path. MKE needs a lot of education on the rights of bikers! I enjoy commuting 20 miles one way to work, but I am getting tired and frustrated by so many idiots that think I should not be on “their” road. Why should I and other commutors get honked at, cussed and yelled at, cut -off, or skimmed by? It is not a lack of paths or bike lanes (though that might help) – it is purely EDCUATION. Reason why deisgnated bike lanes won’t be the answer: I have been on them in MKE and watched cars use them as passing lanes. The Bike Fed is working to educate people about the laws through the Share and Be Aware campaign using as many message channels as we can. In Milwaukee, since you bring it up, we now have multiple billboards with the same message along the freeways. Those signs are seen primarily by hundreds of thousands of people driving cars every day. Wheel and Sprocket has generously donated for those billboards as well. We also have radio and television PSAs, teach classes, work with drivers ed instructors and make in-person appearances at major events, even if they are not bike events. Thanks for reading and for supporting our mission with your membership and by riding your bike!